We offer a variety of cake boxes to suit many different bakery products from cup cakes to gateaux or single slices to whole cheese cakes. 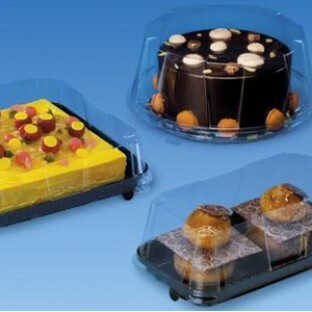 Both our hinged containers and our separate lid and base offers have full transparency which helps your cake stand out in the retail environment, offer great protection for even the most fragile of foods, have a fog-free coating to prevent misting and have our snap shut system which you simply press to close. If you cant find what you are looking for please contact our sales team.